Self Catering in the perfect base for the great outdoors. These three purpose built Cottages, were built in the year 2000. The cottages are of modern construction and yet have been designed to complement the architecture of the other houses around the village shinty park. They have a splendid outlook over the park towards the Mamore Hills at the other side of Loch Leven. Behind the cottages is Beinn a Bheithir, a ridge that has three peaks over 3000 feet high. 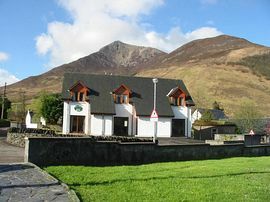 The cottages are in the village of Ballachulish, just one mile away from the bottom of the Pass of Glencoe and fifteen miles south of Fort William. 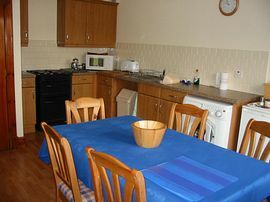 They are tastefully furnished and electrically heated throughout. There is no extra charge for the electricity used. 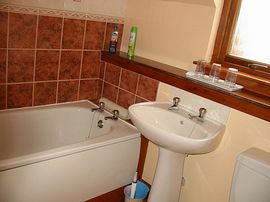 Ideally the cottages have been set up for four people using the two bedrooms on the upper floor. 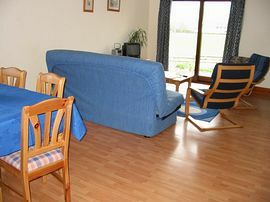 For a family situation the sofa in the lounge can be converted into a full size double bed so that a family of six people can be accommodated. 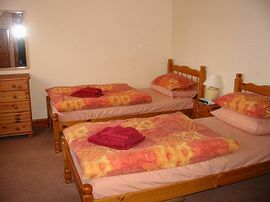 Bed linen and towels are provided at no extra charge. Especially useful for families is the clothes washing machine, which also incorporates a tumble drier. In the porch area a dehumidifier deals efficiently with damp outdoor clothes and gear. Surrounded by some of the most spectacular loch and mountain scenery in Scotland this is one of the most photogenic areas in the world. This is also an area that is steeped in Scottish history and there is a good interpretation of some of that history in the National Trust for Scotland site in Glencoe. A natural crossroads for touring in all directions. At the base of the Pass of Glencoe - ideal for all walking and climbing activities. Leave the A82 road into Ballachulish, turn left at the Co-op shop and the cottages are 150 metres ahead on the right. Citylink buses run from Glasgow through the village of Ballachulish on the way to Fort William and the Isle of Skye. To Fort William then by local bus towards Kinlochleven. To Glasgow or Edinburgh and then by bus. Please see our web site for details of tariff and availability. Normally Saturday to Saturday reservations but, out of the peak times, short breaks and other start days are possible.